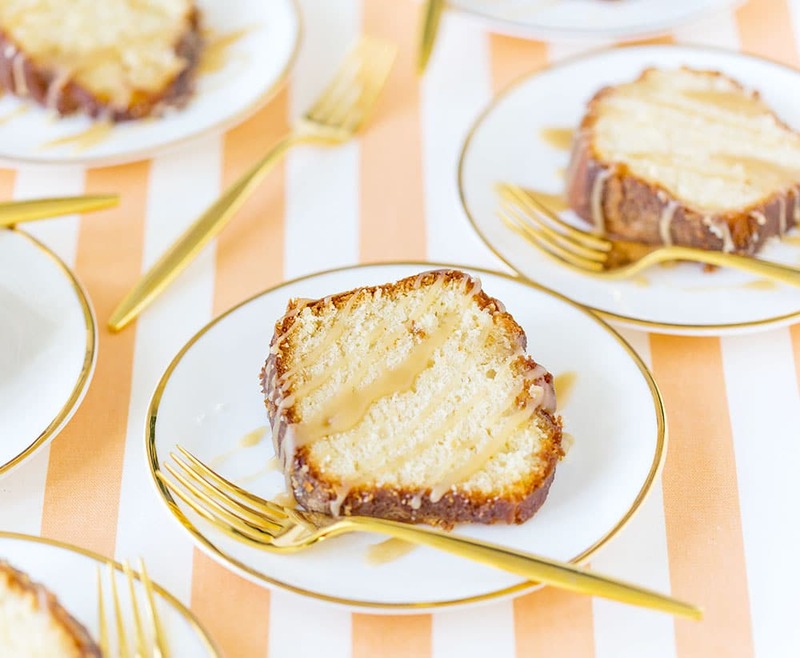 A mouth-watering rum cake soaked with a rum glaze and drizzled with a rum icing glaze! 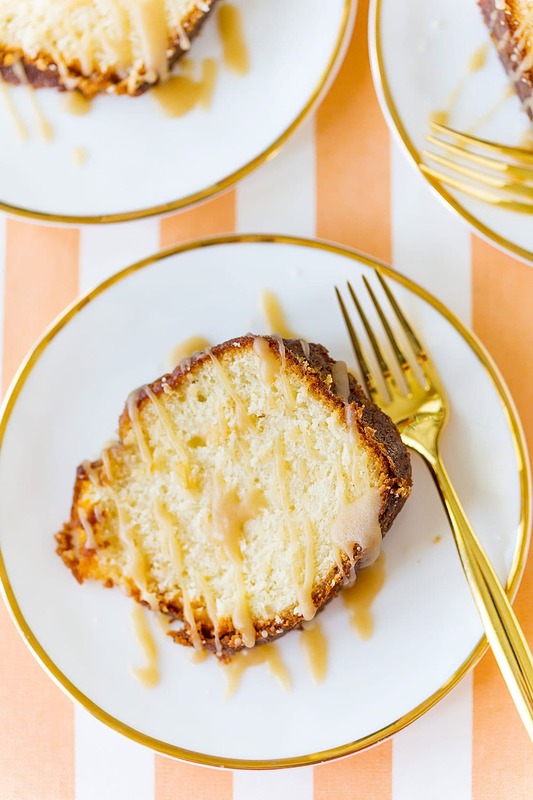 While I do have a few of my favorite crowd-pleasing salads coming to the blog soon, I was feeling rather indulgent and decided this Rum Cake with Rum glaze must be shared. It couldn’t wait any longer. It’s the absolute best rum cake I have ever tasted. If you’re looking for a party cake or a sweet to serve when you have guests arriving, this dessert is your winner. Ironically, I’ve never been the world’s biggest rum cake fan. When my husband and I were on our honeymoon, we enjoyed rum cake in the Bahamas, but it was always heavily soaked with rum. Granted, there isn’t anything wrong with that, but I want to taste the cake too! I’m a cake girl! This rum cake has the flavor of rum (that you can tailor to your tastes) while also being a mouth-watering, delicious cake. 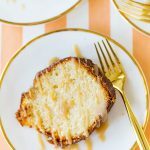 The rum cake does have a rum topping that is poured onto the cake, but it also has a rum icing glaze that’s consistency is similar to a thin icing. I drizzled it on each piece before serving, and they were gone in minutes. It’s THAT good! I want to experiment with tailoring this cake with other flavors. There are so many possibilities when you have a cake base that is out of this world. Can you imagine a pumpkin rum cake? Or Chocolate Rum Cake? My Mom is to credit for this recipe when I told her that I love rum cake but have yet to find a recipe I truly love. She spent weeks taste testing and tweaking her recipe until it was perfect. We are eager to serve it up for a few upcoming holiday occasions. It will definitely be our choice of dessert! Now, let’s talk about the glaze and icing. There is a rum glaze that is poured over the hot cake. It soaks in and makes the cake extra moist and flavorful. Then, I took the same rum glaze and turned it into an icing glaze to drizzle over top. You don’t have to include this step, I just loved the extra touch of sweetness. 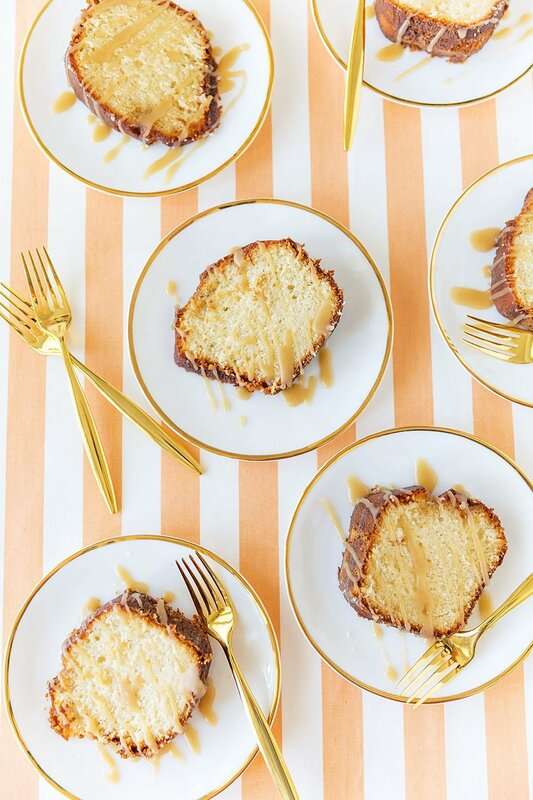 A delicious cake with rum glaze soaked on top! Combine butter, shortening, and sugar in the bowl of an electric mixer (or mixing bowl and hand mixer). Beat well, until blended. Add eggs, one at a time, mixing thoroughly between additions. Add flour. Combine. Add buttermilk. Combine. Next, add baking soda, salt, baking powder, and vanilla extract. Mix to combine. Lastly, beat in the rum and pour into a buttered and floured bundt pan. Bake at 350 degrees F. for 1 hour or until a toothpick inserted in the center comes out clean. Combine all ingredients in a sauce pan and bring to a boil. Spoon over the cake while still warm. Make a second batch of the rum glaze. Allow it to cool and whisk it with powdered sugar until it's a pourable icing consistency. Add more powdered sugar for a thicker icing. Drizzle over cake. Enjoy! This looks delicious especially with that glaze! Wow! Your glaze is making me want to go to the store and purchase the stuff to make it. YUM!! I can’t wait to make this!! It looks and sounds incredibly delicious!